So how does a nontraditional student pay for college? Tuition is going to cost you, even if your school selection is a state- or city-owned college. Teachers are underpaid and inflation hibernates for no one. 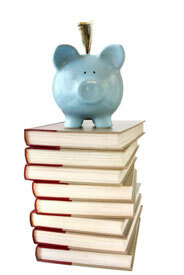 College textbooks will cost from $200 to $400 per school semester, so make sure you tack on this “hidden” fee. Travel expenses, lunch and do-dads can add on a chunk too to your college tuition. Occasionally, your professors might ask you to buy something that you’ll never use again like graphing paper or a jackhammer, although the jackhammer might come in handy for the re-finishing project that you’ve never got around to. To cut cost for college, look around your home and ask yourself, “Do I really need cable TV, a cell phone, Neflix rentals and weekly Chinese take-out–pizza too?” These things can add hundreds of dollars per month to your household expenses. Some things like Starbucks coffee, you do in fact need. So make room for this one. Another way to cut cost is to take public transportation–unless you live in a small town and the nearest college or university is 60 miles away; but do you think you can hitch a ride? You’ll save on car payments, insurance and gas. That’s a hefty hunk of change per month. And enough for college tuition. You could always re-mortgage the house and live on Ramen Noodles if you own a home. College is an investment. Oftentimes, rent or mortgage is the most expensive monthly payment of any household. But think of it as a stock option: It’s low-risk and has a high return in the shortest amount of time. What broker can offer you that? The admission’s office can!